Review Context: I am a big fan of strategy games as a whole, loving franchises like Fire Emblem, yet I have never truly played a fully guerrilla tactical strategy game. Disclosure: This review was based off of a review copy. Sprawling epic battlefields has never been something I have seen in strategy games before. Not in the sense of geography, but how much depth a single battlefield can bring in a medieval combat simulation. That is what immediately gravitated me to Tahira: Echoes of the Astral Empire. It continued the skirmish on the same battlefield or expanded the battlefield just as a usual battle most likely would have been fought. During Fire Emblem games or Valkyria Chronicles, instead of phases to the battle it more often than not implemented a small trickle of reinforcements or a hidden ambush. While I love that, something akin to large scale guerrilla combat is not something I see often and was intrigued because of that. The combat was enough to sway me towards Tahira, but does it manage to hold my attention throughout its short campaign? Tahira: Echoes of the Astral Empire takes place in almost a single night as you fight with the remnants of the Avestan army against the invaders from the Astral Empire. You take control of Tahira, Princess of Avestan, as she leads a ragtag band of Avestan knights and Oranian allies as they protect what is left of the countrymen. My major problem about this game is that the story is far too short and it feels like I played a prologue to a much larger game. The story for such a short amount of time and a small cast grabs you with fantastic dialogue and likable characters, even if most of the reasons as to why this is happening hasn’t been touched upon enough to garner a reason to the war besides the Astral Empire wanting revenge. Due to the lack of story or progression on the overall plot involving Tahira and her powers I feel more teased than anything else. If my only critique on the story is that there isn’t enough of it and I have to wait after that cliffhanger of an ending, then it just means I really loved the story. From its messages about inner acceptance, to what you can do with the world and making the tough choices as a ruler, the story manages to grab you in such a small amount of time that you desire more. In just a bit more than one night you understand this ragtag group of survivors and their reasons for fighting. The only one who of course develops over the course of the journey is Tahira, and for good reason, as she begins to see visions of her powers and starts to see a different side to the world. Though the others don’t develop, that doesn’t mean you won’t enjoy their banter. The Claw and the Hammer are a mercenary duo whose relaxed nature in the face of overwhelming odds comforts you. The wise words of Baruti, the captain of Tahira’s royal guard, grants you foresight as he fights his all for you. Having a small group of central characters allows you to delve more into them and allows you to hone in on their stories. Each character has weight behind them in the main cast and that is fantastic. The enemy on the other hand is only really one main antagonist, General Faramond, who did not get enough time to even develop much of a character to be predominant. You face off against numerous named enemy commanders who are just the same as the last, and in that way you’re only facing off against a faceless army that loses the duality to the conflict and doesn’t give you a true face to fight against and point your anger or sympathy towards. There are of course sections where you walk around and talk with the group you are fighting with. These sections are meant to alleviate the player after the long grueling battles, yet they are easily the worst part of the game. More often than not these sections are a slog to get through as you learn more about the main cast through the story chapters. One could argue that learning about the group of people you are with that are the supporting cast, such as Abdullah is important, yet none of the characters are ever really fleshed out and are often bland adding nothing. I say this because even in combat you cannot see who is on your squad, as this supporting cast are turned into generic stand-ins during battle. They do have portraits for the supporting cast, yet during battle they are not seen as the specific character. This takes out the importance of these walking around sections to talk to your army. The only ones you see during battle are the main cast and nobody else, thus you feel no attachment to the generic units you have, despite the supporting cast you are given. It is one flaw that makes me question an entire section of the game and kind of ruins the experience that other games like Valkyria Chronicles and the Fire Emblem games give with their casts of complex and invested characters you want to learn about in the supporting cast. 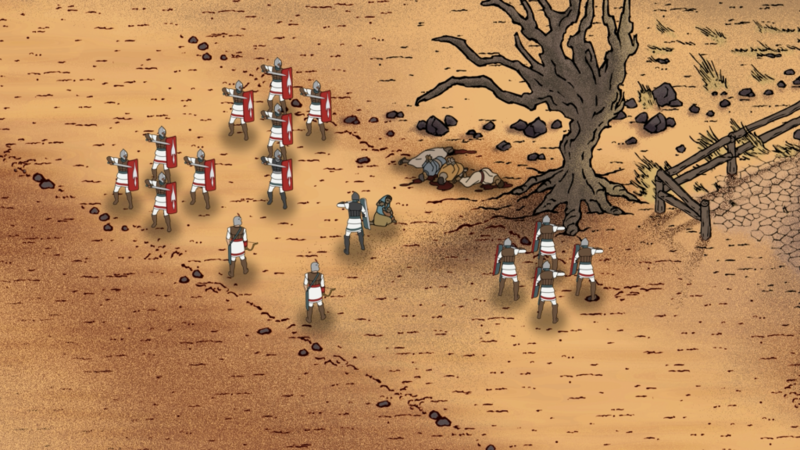 Combat in Tahira is definitely long and arduous. It uses a classic grid-based combat with a simplistic UI. The bar on the bottom allows you to toggle on enemy movement, what each thing on the map means, nothing out of the ordinary. Easily accessible, as it showcases each units type and when they can move, as well as an automated skip to the next turn after all units have moved. It allows the flow of battle to continue. There are a few problems I have, and all of them except the lack of saving to other profiles or whenever you would like other than quitting the game are just minor nitpicks not worth mentioning. The complexity of the game’s battles forcing the player to use guerrilla tactics in every fight, which can be quite taxing, especially over a multi-tiered battle. Each stage has tutorial guidance for the new elements it implements, which is why I originally thought I was still only in the prologue. Each new battlefield brought a new tactic to liven up the way you fight, from ambushing to protecting certain points, all the way to saving hostages from the Astral Empire. The constant shifting of battlefield tactics and the implementation of the ambush mechanic forces the player to think of specific units to hide away until a certain moment and when to utilize them as the ambush could happen while the enemy is moving. The ambush mechanic is easily used, but on harder difficulties is hard to master, especially on where to place them and when to use them in tough scenarios. Once you pull the sword on the sidebar, everything stops and the momentum is under your control during the ambush and it feels amazing. The units used by you have four different sets of skills and when they move. The mercenaries and the Claw are always the first to move and are used as fast moving units that go in for the kill with a lot damage. The Hammer and her fighters are the tanks, which move last, that can stun enemies and help units move by the enemy with taking hits. Baruti and the Avestan knights are the balanced units that can deal damage and take it. 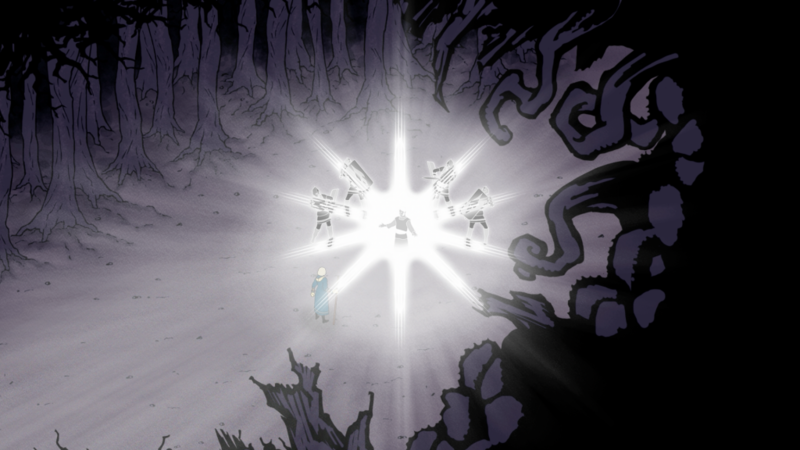 Tahira is the one who uses astral magic in order to attack the enemy in droves. All of these units together help to create a need for guerrilla-like tactics, as more often than not you will be outnumbered and the enemy will have ranged units. You can allow units to wait until the precise time to strike or you can use them in a frontal assault to defend a position. It is all about delegating specific units into certain ambush positions and determining which units will hold the line, giving a true essence of strategy to each scenario rather than running your units into battle not being afraid you will lose them. Rotoscoping the units gives each one a sense of fluidity with their movements and life. Much like The Banner Saga and classic movies like Snow White, this art style really helps to create life on the battlefield. There is dedication to each model and that shows all of the way throughout the game. There is a distinct lack of diversity in the models, so a lot of the enemies are similar, which makes each unit other than Tahira with her own animation set kind of faceless in how they attack or act. 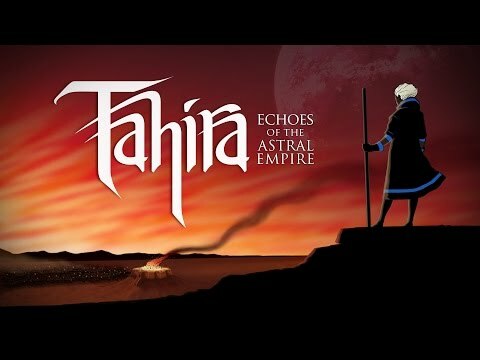 For an indie studio, I feel like they did above and beyond for Tahira: Echoes of the Astral Empire in terms of creating fluidity and a world/tone through their music. The music I most remember from the game was the one used in the final battle, as it rocks you to your very core with its low booms. You can feel the tension building within you. You can tell that Whale Hammer Games derived different cultural musical influences into creating both the world and score and it all works. 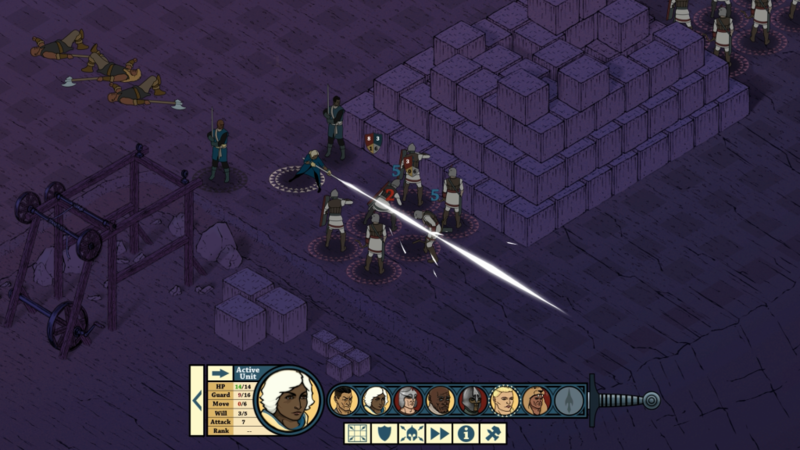 Tahira: Echoes of the Astral Empire is fun despite its short length in possibly being the first entry into a series of games. It manages to get you invested into its small cast of characters as you fight long arduous battles for the sake of your countrymen. The problems often come from aesthetic problems involving investment with certain sections of the game or with the supporting cast during battle. There is decision making to be done during the downtime sections and I didn’t see much of an impact to the decisions made. That is where my core concern with the game is as of now, as being too short hinders this game from being all it could be. Investing about the seven to nine hours to play the game, only to be left with a cliffhanger kind of ruins part of the experience for me. Again, wanting more is never a bad critique, yet it does halt me from singing its high praises no matter how invested I became. This is just one piece of the puzzle, and for it to have both little impact overall and large impact with me resonating with its characters means I’m ultimately mixed about the game. I did have some technical problems with the game, but they were none that didn’t set me back too far. Tahira: Echoes of the Astral Empire feels like a prologue to a larger game and for that it really hurts it, even though it excels in both its teasing story and its complex guerrilla gameplay.